Thanks to mine and Sean’s recent move back to Michigan, I’ve had the opportunity to switch up my morning routine. I used to have inconsistent mornings, because I worked in the office certain days and at home other days. Now I consistently work from home every day of the week, so I’ve been able to build the morning routine I really want. Before the move, I heard on the podcast Happier that the best time to start a new habit is right before a big life change, like a move. Hearing this while in the midst of moving was really helpful, because it prompted me to really ask myself what habits I want to change, and then figure out how to implement them in my new life. That’s how I came up with this morning routine. At 6:15 every morning, our Alexa Spot goes off with a really great alternative station Sean has put together in Pandora. We’ll typically have her snooze the alarm once, then lay in bed listening to a song or two, and then I’m up and out of bed. This is a really nice approach for us, because we can start the day slowly and intentionally. There’s no rushing around and jumping out of bed as soon as the alarm goes off; that level of energy stresses me out first thing in the morning. I much prefer a more relaxed routine. Once I’m out of bed, I get dressed and let the dog out. I try to dress at home like I would in the office: typically jeans and a nice v-neck. I don’t get “dressed up,” because my nicer clothes are more expensive, so the less I wear them, the longer they’ll last. But I at least dress up enough so if I have to hop on a video call, I’m presentable. Plus, I feel more productive in jeans than I do in leggings. Once I’m dressed, I let Stanley out. If I’m going for a walk that morning instead of a run, I might make myself an iced coffee before heading out the door. Once Stanley is back inside, we’ll put his leash on and either go for a walk or a run. Typically we go for a run on Monday, Wednesday, and Friday, since I’m working on Couch to 10K as part of my 101 in 1001: Take 2 list. The other four days of the week, we’ll go for a short walk. This is something I very intentionally put into my morning routine. I felt really guilty when we were living in Cincinnati about how rarely I took Stanley for a walk. I knew that the best way for me to stick with it would be to do it first thing in the morning, and that’s really helped. It’s also on my 101 in 1001: Take 2 list! Once we get home from our walk or run, I’m in charge of coffee. Sometimes I already have mine made, but oftentimes I’m making it for both myself and for Sean. We have an espresso machine that I use to make our coffees, and it’s wonderful. I’ve been making myself iced coffee lately, and Sean gets a black Americano. By 7:30, Sean has left for work, and since I no longer have a commute, I treat myself with 30 minutes of reading. This has been a really helpful way to start my day slowly. I’ve tried watching an episode or two of Friends before work, but it just doesn’t have the same effect on my day that reading for 30 minutes does. P.S. Interested in what I’m reading? Send me a friend request over on Goodreads! And finally, I begin work. Even though I could start work at 7:15 or 7:30 if I wanted (and then finish up for the day by 3:15 or 3:30), I’ve been pretty protective of my mornings. Unless I have something going on when I need to work an extra half hour in the mornings, I choose not to start the work day until 8 am so I can take my morning slowly and intentionally. 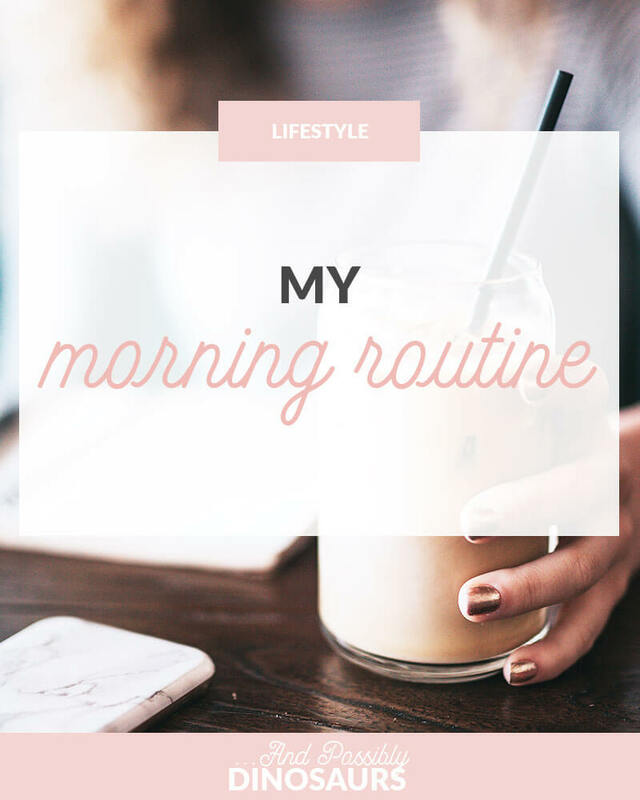 Morning routines come in all shapes and sizes because everyone’s life is different. That’s what’s so cool about them! And I have the feeling that over the coming months, mine will continue to evolve as well. What does your morning routine look like? Is there anything you absolutely can’t start the day without?